Are you traveling out of town this Thanksgiving? Traveling during the hectic holiday rush can be stressful enough. If you have kids, you know that it’s even more stressful! Fortunately, there are ways to travel during the holiday season without losing your sanity. Check out these Thanksgiving traveling tips with kids. If you have kids, you might want to take some extra vacation days and leave earlier than you normally would. When you travel during Thanksgiving, a lot of other people are traveling as well. This makes it hard to keep track of your kids. You also feel like you need to keep your kids on their best behavior, which can make traveling even worse. Lessen this stress by traveling a few days ahead of the rush. You’ll arrive at your destination more relaxed and ready to be thankful. A great way to travel to your Thanksgiving destination is to bring distractions for your kids. This can be anything, as long as it’s something that will keep your children occupied for hours. Great distractions to bring include a tablet, books, games, toys, and coloring pages. All of these things can help keep your kids in their seat, playing quietly. If you have a couple of kids, you probably won’t be able to travel on your own. Consider bringing help to make traveling easier. If you or your spouse has another family member traveling in the same direction, ask them to take the same flight as you or ride in the car with you. This gives you another set of eyes to help keep those kiddos in line and can also be exciting for your kids since they get to see a favorite family member. Traveling over Thanksgiving doesn’t need to be the end of the world for you. These tips are sure to make your trip less stressful so that you can enjoy your holiday vacation. Let's discuss: What are your best traveling tips for Thanksgiving? My biggest tips is to get all of your ducks in a row before you do anything else. Being prepared saves so much stress. It's always best to be prepared! You can say that again! We have been on road trips quite a bit and it's always been a nightmare if they're not kept busy. I always make sure the devices are fully charged and the snacks are in full effect. My kids become monsters when they're hungry and bored. Oh I can relate to that since we do road trips and that happens with my kids too. These are great travel tips. What really help us was having a portable DVD player. My son liked to watch movies while we traveled. We have one in our vehicle and that does seem to help. Having them watch a movie. If the distance is really far, like several hours, I used to bring small wrapped gifts that I gave out on the hour. There were certain stipulations, like no whining or fighting, but that wasn't usually a problem. Sometimes they were print off games that they could play in the car, like the license game, or the ABC sign game. Always something fun! I like that idea about the gifts. Usually when we road trip, it's usually on a trip that goes at least 15hrs or more so it definitely won't be a gift on the hour. Distractions are great when kids are traveling. We used to have a portable DVD player for the kids, and now they can bring their iPads. My youngest daughter takes her iPad while the others live on their phones. That seems to work for all of us. Those are great tips! I am all for distractions, people want to say kids need to be bored, but I am fine with games and coloring. We try not to watch movies all the time though! Games and coloring is also a great way to entertain on trips. These are great tips. We always pick out one of two movies for the road. That is an awesome idea and one that we also do. My minivan actually has movies in it that the kids like to watch. These are great tips - I really like the one to leave early, plus you get to visit with family longer so that is a plus! That is true unless it's family you'd rather not see. Yes...bring distractions! And I think it's always better to bring more than you think you'll need because you don't want to run when you still have 2 more hours to drive lol! That's a great idea indeed. I always walk with quite a lot since our road trips are never less than 10 hours. We always try to bring easily accessible snacks and a change of clothes for the car ride in case of any spills. We also cant ever forget our favorite stuffies and blankies! Oh no, don't forget those. You don't want a kid riot on your hands. Thanks for these great tips! We love traveling during Thanksgiving. Will definitely try these tips this year! That is great, where do you normally travel to? Is it a long trip? That will be great! I've never thought of Thanksgiving at Disney, I have thought of Halloween or Christmas, but that is a great idea. I'm sure that the kids will enjoy whatever you come up with. Traveling with kids can be difficult, but these are some great ideas. It is definitely manageable when we plan ahead! Planning ahead is always the way to go. Ooh I needed these tips! We're going to Texas this year for Thanksgiving! I'm really excited but keeping toddlers busy on the plane is always tricky! I have tips that you can use for traveling with toddlers on the plane that you can also check out. Bringing help and distracting them I think is key. Having a plan and not winging it will bring success. Sometimes winging it also works. I have actually winged it a few times and it seemed to have worked fine with us. Leave early - Amen to that! I feel like any time we have to be anywhere, whether five minutes away or five hours early is key. I'm a stickler for being on time and even for being early, so that's my one thing that I love doing. We never have to travel far with the kids for holidays - but these are some great tips (and will be good for a summer road trip - because you know me... planes and me don't mix). Jennifer, I do know that you're not a fan of planes but we all know the statistics and that they're much safer, but whenever you're ready for a road trip, you'll love this. I would think that distractions are a must! After all, this is said to be the busiest travel holiday of the year. Yes Thanksgiving usually is one of the busiest time of the year. Oh you can't go on a trip without snacks, definitely have the snacks. Great travel suggestions!!!! Traveling with kids doesn't have to be this huge challenge people think it is if you prepare correctly! Oh it most definitely doesn't have to be. Prepare as much as you can however because kids get bored pretty easily. Traveling with kids especially if its a longer ride is all about distractions. I know tablets are what distracts many kids but I remember growing up and bringing a couple of books to pass the time. Bigs for kids can help too! You'll be surprised at how easily you can get engrossed in a book and before you know it, a few hours would have passed. The holidays are so much fun, but can be so stressful. 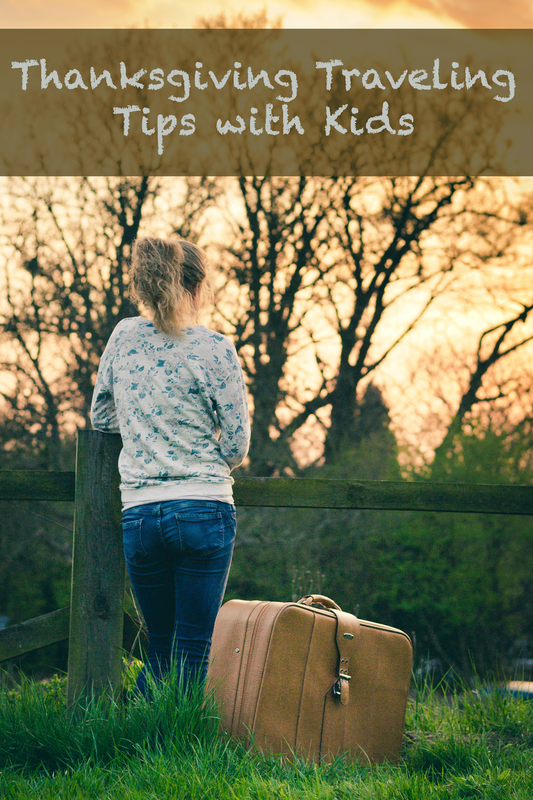 I'm grateful we don't often have to travel far, but these tips are great for those who do. Thank goodness, I've never had to travel long distance with the kids for Thanksgiving. These are some great tips and I think that it helps to relieve some of the stress on parents during the holidays. While I've never traveled with the kids at Thanksgiving, I've traveled at other times and these tips always seem to work. Great tips! I love the idea of leaving early since road trips with kids always take MUCH MUCH longer with all the bathroom stops and stops to stretch their legs. You can say that again! On every road trip that I've taken, it's always taken at least 2hrs longer because of that. We don't have to travel for thanksgiving, luckily. I image these could work for traveling at anytime of year though. Oh yes these tips can work at any time. We have to drive 10 hours to see my grandma and though my kids are older, it is still stressful being in the car with them that long. The best thing that we have learned to do is stop halfway and spend the night. I can usually do 10hrs without staying the night, anything longer than 12 is when we stop but that's a good idea as well. I don't have kids but I do have a cat and he can be a handful during trips (although nowhere as much as kids I'm sure lol). I do think some of these tips can apply to a pet as well. I always try to leave extra early and bring someone along to help and bring lots of treats and his favorite toys for distraction lol. I've never thought of traveling with my pet. My neighbor takes care of my dogs and cats when we leave, but I'm sure they can work for them too. What a smart idea to ask for help. If someone in the family is going the same direction, they're probably going to be happy to have that 'kid time' in too! If you're all going the same way then yes it's a good idea to ask for help, why not? The least they can say is no! Leave early is such an important tip. Especially during the holidays when so many people are on the road or in airports. Whenever we're going on a road trip, we always try and leave by 5 or 6am so we can beat the morning rush. Thanksgiving was always hard when my ex and I were together. We had to divide time with his daughter's mom's family. Then his family and mine. Oh that sounds stressful on it's own. I can't even begin to imagine how that would be. We're traveling for Christmas. I'm taking 2 days to make a 10 hour drive but allowing time to stop along the way and let our son relax or play. 2 days for a 10hr drive? The only time we've done 2 days is when we traveled for 25hrs. Usually our 10hr trips are done in a day. I like to get to wherever I'm going fast so I can relax. It is so true that when travelling you need to bring distractions of some sort. It makes the trip go that much faster for the kids and for you. It does make it go easier for everyone involved. Thanksgiving is one of those holidays that we gear up for because of all the great food. We definitely head out early so that the kids can still sleep in the car if they are tired. Don't you just love Thanksgiving and all the good food that you get on that day? We don't travel for Thanksgiving however since we do it all at home. My mother-in-law once traveled with us when Cassidy couldn't. Help really does just that! It helps! We're lucky because we're not traveling or hosting this year. My local in-laws are hosting. Joyous joy! That is awesome and I'm pretty sure that you were very grateful for the help. This year we're hosting so I'm happy that I don't have to travel. I'm not a parent but nothing but patience, kindness and loving tendencies will go a long way! Patience is right, without it you'll be going crazy on that trip.